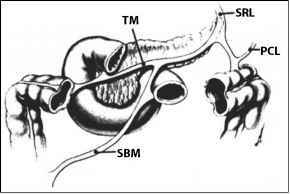 The major ligamentous attachments of the upper abdomen include the lesser omentum, the gastrosplenic ligament, and the splenorenal ligament. The lesser omentum is subdivided into the gastrohepatic ligament and the he-patoduodenal ligament. 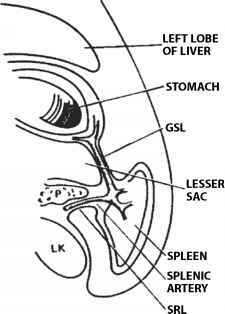 In the embryo, the gastrosplenic ligament gives rise to the gastrocolic ligament (also known as the greater omentum) and the transverse meso-colon. The gastrohepatic ligament can be recognized on computed tomography (CT) scanning as a fatty plane, which joins the lesser curvature of the stomach to the liver. It extends from the fissure for the ligamentum venosum to the porta hepatis and contains the left gastric artery, the coronary vein, and associated lymphatics. The criterion for nodal enlargement in this region is somewhat smaller than for elsewhere in the abdomen; nodes in the gas-trohepatic ligament are generally considered abnormal when they exceed 8 mm in diameter . On occasion, pathology in the gastrohepatic ligament may be mimicked by unopacified bowel loops, the pancreatic neck, or the papillary process of the caudate lobe of the liver projecting into the expected plane of the gastrohepatic ligament [3, 4]. The gastrohepatic ligament provides an important conduit of disease from the stomach to the liver, in that the subperitoneal areolar tissue within the ligament is continuous with the Glisson capsule (the perivascular fibrous capsule within the liver). 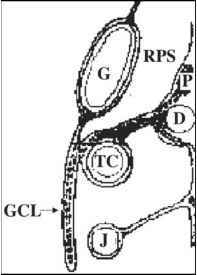 Thus, gastric malignancy can spread via this pathway directly into the left lobe of the liver and vice-versa. 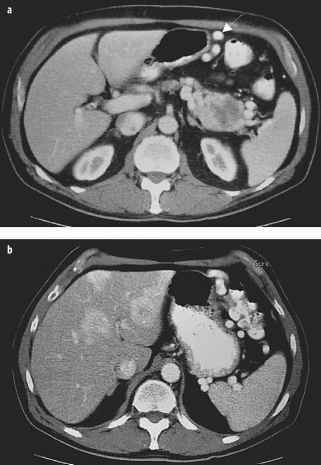 Common neoplasms spreading via the gastrohepatic ligament include nodal metastases from gastric, esophageal, breast, pancreatic, and lung cancer as well as nodal involvement of lymphoma. Gastric and esophageal cancer can directly invade this ligament and spread into the left hepatic lobe . The hepatoduodenal ligament is the free edge of the gastrohepatic ligament along its rightward aspect. It contains important structures of the porta hepatis including the common bile duct, the hepatic artery, and the portal vein. The hepatoduodenal ligament extends from the flexure between the first and second duodenum to the porta hepatis; the foramen of Winslow is immediately posterior to this ligament, permitting communication between the greater and lesser sacs . Nodes of the foramen of Winslow, or portocaval space, have an unusual morphology such that their transverse dimension is greater than their antero-posterior (AP) dimension. Generally, the upper limits of normal for the AP dimension is 1.0-1.3 cm, whereas the transverse dimension can be up to 2.0 cm in width. Size criteria are somewhat less helpful than in other lymph nodes. In the absence of frank enlargement, a more spherical shape or central necrosis suggests the presence of tumor within these nodes (Fig. 1) [6, 7]. A broad range of tumors may spread via the hepatoduodenal ligament. 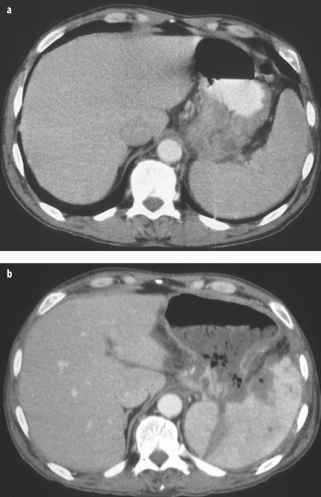 Liver or biliary cancer, whether primary or metastatic, may spread in an antegrade fashion through lymphatics in the hepatoduodenal ligament to deposit in periduodenal or peripancreatic lymph nodes. Similarly, malignant disease in the nodes about the superior mesenteric artery (commonly involved with pancreatic and colon cancer) can spread in a retrograde fashion up the lymphatics in the hepatoduodenal ligament. Lymphoma can involve these nodes as well. Primary gastric cancer arising in the lesser curvature of the stomach can directly spread through the gastrohepatic ligament to the hepatoduodenal ligament and then to peripancreatic and periduodenal nodes. Vascular complications related to the portal vein and hepatic artery can result; portal venous thrombosis and hepatic arterial pseudoaneurysms can occur in advanced cases owing to their coexistence in the hepatoduodenal ligament [1, 5]. and medially [9, 10]. As such, it provides an important pathway of communication between the stomach, the spleen, and the retroperitoneum. 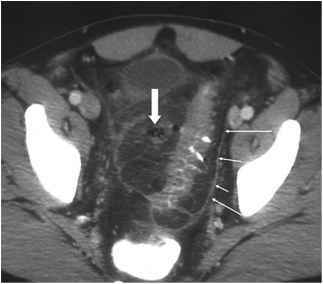 Gastric malignancies commonly spread through this ligament (Fig. 3). 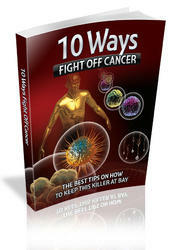 Such diseases can involve the spleen and ultimately result in disease about the tail of the pancreas. Conversely, pancreatic neoplasms may spread via the splenorenal ligament to the gastrosplenic ligament and involve the greater curvature of the stomach . the stomach, transverse colon, and pancreas, the gastrocolic ligament serves as an important nidus for the peritoneal metastases that commonly occur with ovarian, gastric, colon, and pancreatic cancer [12, 13]. Finally, dilated veins within this ligament may represent gastroepi-ploic collaterals resulting from splenic venous compromise that might occur in the setting of invasive pancreatic tumors, or intraperitoneal tumors, which spread to the retroperitoneum via the transverse mesocolon (Fig. 5). 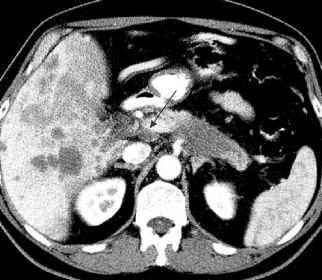 What does metastatic gastrohepatic ligament look like?